Almanac is a digital school calendar that organizes all projects, assignments, exams, and classes into one mobile portal. How can we design a product for students to alleviate the stress of workload and time management while giving them access to a fully organized schedule. Integrating a full student profile into an organized mobile calendar dashboard. Almanac helps students by providing them with a full organized schedule of their daily student tasks and term tasks. 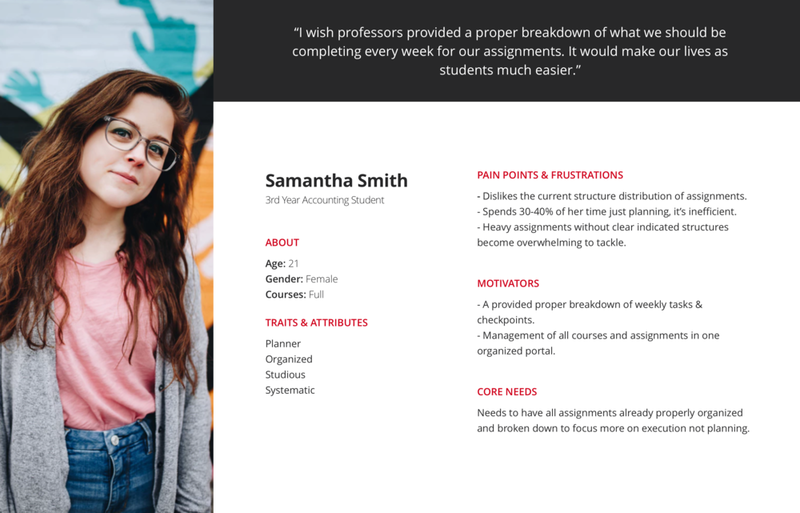 The student profile gives a detailed recommended breakdown of week to week tasks for assignments and exams, alleviating the stress of further planning. For a more personalized experience, the product is personalized through the branding of each school. In order to understand the space further and create the right solutions, I had to be able to empathize with many different students. The initial research for this project began by simply interviewing students and professors of different backgrounds, skillsets, and academic behaviour. After over 20 discussions with a multitude of different student profiles and professors, my understanding of the problem became much more clear and defined. Too much time and stress being spent on planning instead of doing. An overload of information is overwhelming to tackle. Stress overload typically comes from the lack of task breakdown. Minute problems such as looking up course & lab schedules is irritating and causes unnecessary mental fatigue. Following our primary research, I moved onto creating a PACT and Competitive Analysis that helped me get an understanding the management pain points I wanted to help alleviate. Using the primary and analytical research, specific personas were created to use as the target profile for who I was designing for. Following the research phase, I focused on creating a general flow chart for the product. This allowed me to visualize how the entire product would work from a wider point of view. Furthermore, by completing this process early on, it allowed me to quickly build on the overall product when needed. Colour and font selection for Almanac. The application on-boarding process goes through simple explanations of the primary features as well as a profile set up. For first time users, this allows them to get familiar with the product with a simple user experience. With weekly, monthly, and yearly views, students can view their schedules much earlier in advanced if needed. Almanac provides the breakdown of each course and assignment, helping students stay ahead and mentally focused. Full information of assignments are shown based on each course. Each assignment also shows a recommended week to week breakdown of tasks to help students stay organized, alleviating the stress of planning.